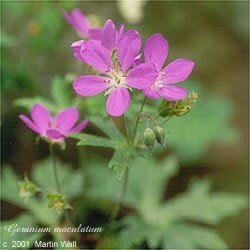 Actions: astringent, anti-hemorrhagic, anti-inflammatory, vulnerary, anti-catarrhal Indications: Cranesbill, also called American Cranesbill, is used in any cases where an effective astringent is needed, including diarrhea, dysentery and hemorrhoids. It can be used in cases of internal bleeding, such as ulcers. It is also helpful in cases of excess menstruation or uterine hemorrhage. Preparation and dosage: blend 1 or 2 teaspoonsful of the herb into 1 cup boiling water. Simmer 10 minutes. Drink 3 x daily. Tincture: take 1 teaspoon, 3 x daily.